The average twenty something in the UK will spend £263K on housing over the next 32 years of their life, and many will spend considerably more, which is, let’s face it, an enormous sum of money. What I find deeply offensive about this astronomical figure is that there are a few brave souls currently engaged in what you might call ‘experiments in alternative living’ which demonstrate that it really is possible to live well without mortgaging your life away – for example, the house below cost £3K and took only 10 days to build. Given this, I think normal housing strategies are in need of serious reconsideration, and to this end this post provides a number of experiments in alternative housing options which means you don’t have to spend £300K on housing yourself over the next 3 decades! According to this is money, a typical first-time buyer who buys a £151,000 home with a £121,000 repayment mortgage over 25 years will pay back £191,600, calculated at 4% interest. This works out at £638 a month or £7664 a year, which is equivalent to 9 years worth of earnings on the median-salary. Of these repayments, interest accounts for £191, 600 – £121, 000 = £70, 000. Combined with the £191.6k loan repayment and the £30K assumed deposit in the scenario above this gives a total 32 year average spend on basic housing costs of £263 600. Obviously, if you are twenty-something, you have the choice to follow a similar path-to-property ownership and just settle for paying out an overall average of £600/ month for 32 years. A key part of the sociological imagination is to make the familiar seem strange and to wake people up to how odd ‘normal’ actually is. In the case of housing, I think it’s very strange that so many of us just go along with paying so much for something that really needn’t cost so much. This post is really just about raising awareness that are alternatives to this crazy mortgage debt-cycle, and the above five alternatives are all viable, even if challenging…. One – Live with your parents – until they die. According to the Office for National Statistics, A total of 3.3 million 20- to 34-year-olds lived with their parents in 2013, the highest number since it started keeping records in 1996. While the prospect of a 34 year old still living with their parents may sound sad, it is good for your finances. Taking the average rent of £5688/ year, if someone were to live with their parents from the age of 20-34, they could potentially save £80 000, and that’s before accumulations on savings are factored in, and for the ultimate savings on housing costs, you could just live with your parents until they die, which is what 42% of current renters are waiting for in order to be able to get their foot on that first rung of the property ladder. Squatting means to unlawfully occupy an uninhabited building or settle on a piece of land. Until recently squatting in England and Wales was generally a civil matter, not a criminal matter, However, in 2012 Squatting was technically criminalised by the Legal Aid, Sentencing and Punishment of Offenders Act (LASPO) 2012, section 144 of the LASPO made it a criminal offence to trespass in residential properties with the intention of living there. However, a few test cases have revealed that if the police find you squatting a building, charge you with squatting and you plead not-guilty, it is actually nearly impossible for the prosecuters to prove that you were actually living in the building permanently. Also, the law does not cover non-residential properties. You need to make sure you do not commit criminal damage to get into the property, and repair any such damage that someone else has done immediately after you take up occupation. Always make sure somone is in the property, because if the property is vacant you can be evicted. You should contact the utilities providors asap to prove that you intend to pay. When the police turn up, do not give them entry, talk to them through the door, and finally research who the owner is so you know who you are up against when you go to court, and don’t expect them to be too happy about it the fact that you’re squatting their property. It’s difficult to say exactly how many people squat in the UK exactly given that squatters don’t generally want to draw attention to themselves, but there are some high profile, political examples – One of the most interesting being Grow Heathrow which was established in an abandoned market garden site in Sipson, one of the villages due to be completely tarmaced to make way for a third runway at Heathrow. Over the past four years the site has played host to a wide range of political gatherings for groups such as: UK Uncut, Climate Camp, Reclaim the Fields, and The Transition Network, so you would need a certain amount of subcultural capital to fit in to this network, but if you can embed yourself comfortably into that sort of thing, then the payback is free accomodation, and probably food too. Also of interest is this site – Made Possible by Squatting which is an exhibition from September 2013 documenting stories of how squatting has benefitted the lives of individuals and communities in London- against the backdrop of the government’s attempts to criminalise squatting. Admitedly this doesn’t seem to be a very popular option here in the UK, so firstly to America for some inspiration…. To Simplify is a blog by someone called Glen, whose been living a mobile life for over 5 years in a heavily converted 1988 Volkswagen Vanagon, which he describes as the closest thing to a home he’s ever owned. The blog simply documents Glen’s life on the open road, and he also details his total van conversion, from totally gutting the original van and then installing a whole range of new features – not least of all the engine and a solar electricity system. 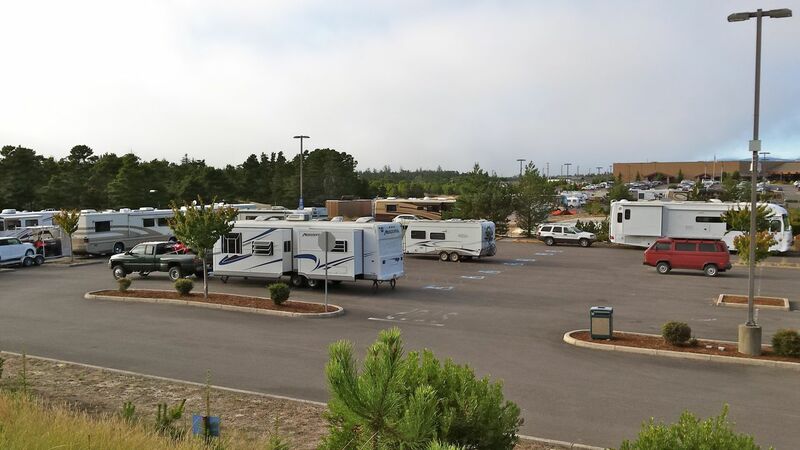 I particularly like this picture in which Glen’s parked up with other, more typical American mobile home dwellers – it sort of sums up his philosophy. Bringing it back across the Atlantic, El Pocito is a nice little blog which, among many other things of an alternative nature, outlines the experience of two art teachers, originally from the UK who spent 9 years travelling through Spain and Portugal in their converted van. The site offers some excellent advice on the realities of van-living on the continent. Campervan Life is a web site devoted to providing advice on buying, converting and living in a camper van, set up by a guy called Darren who bought a cheap Mercedes Sprinter (£1000 in 2006), learnt how to convert it on-the-job with no prior experience or any significant background in DIY and then travelled around Europe in it for 9 months. He lists the ‘van-travel’ related costs of his trip at under £3K, and although he doesn’t appear to include costs of the conversion can’t imagine it would have cost more than £1000, which means that in total Darren had almost a year of comfortable living and travel for under £5K, which is cheaper than the average rent in the UK. Incidentally, living in a van may sound like it’s an extreme strategy for saving money, and possibly only for hippies, and you’d be forgiven for making this mistake given that one of the first search returns for ‘living in a van uk’ takes you to a forum called ‘UK HIPPY’, but there are even members of the relatively conservative caravan club who have lived in their caravans long-term, combining this with either owning a small no-frills apartment, or house-sitting. 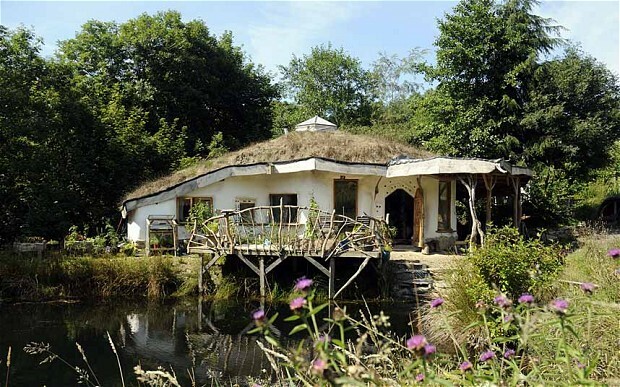 In eco-circles, the best known example of someone who has actually done this is Tony Wrench and his partner, who built their own low-impact roundhouse for about £3K in 10 days (picture above). 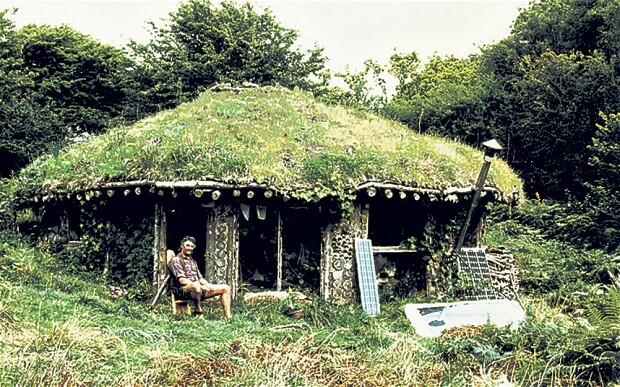 Actually, this may be the only example of a couple who have managed to do this and get away with gaining retrospective planning permission, others, such as the couple who built the beautiful hobbit-house below don’t seem to have been so lucky. For this reason, although this particular strategy is the one I intend to adopt at some point in the future, you might be better off going for option five….. There aren’t very many low impact communities in the UK, this is a very emergent phenomenon, but one example of a group who have managed to get temporary planning for their dwellings is Tinker’s Bubble, a community of 11 adults and 2 children based in Somerset who live on 28 acres of land in self-built houses, grow most of their own food and are fossil-fuel free. I don’t have too many about the economics of the place, but the dwellings most of them live in seem to be of Tony Wrench’s low impact design and the weekly contribution for food is only £20, so compared to the average mortgage-monkey, this represents a significant saving. One of the most inspiring recent examples is that of Llammas. Based in Pembrokeshire, on about 75 acres of land, this is one of the few fully legitimate (in planning terms) eco-projects in the U.K. It combines the traditional smallholding model with the latest innovations in environmental design, green technology and permaculture. The ecovillage was granted planning permission in 2009 by the Welsh Government and is currently part-way through the construction phase. The dwellings being built here are more robust than those in Tinker’s Bubble, and thus more expensive, but over the course of a lifetime these individuals will save themselves well over a £100K per person compared to the average, and have a significantly higher quality of life into the bargain. Although all of the above involve more hassle than the standard massive-mortgage route to home ownership, personally I think a little discomfort and risk is worth it given the injustice involved with said mortgage route – via which you pay tens of thousands of pounds to people who simply haven’t done anything to earn it.